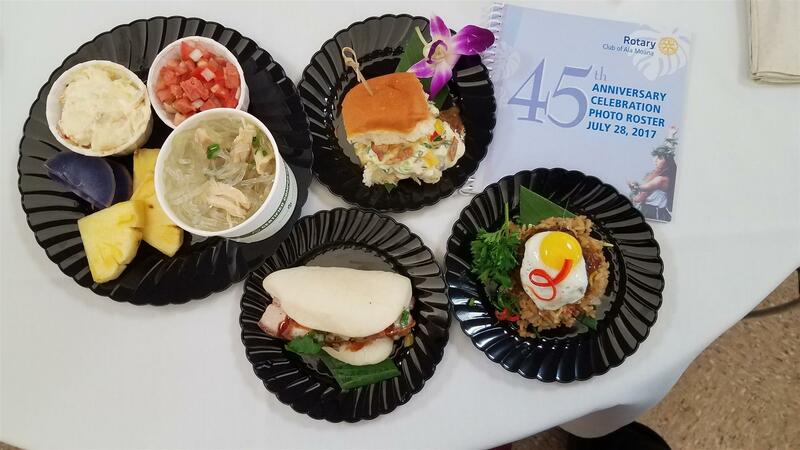 The 45th Anniversary celebration kicked off with a golf outing on Friday, July 28, 2017, followed by a Welcome Party - A Taste of Hawaii later in the evening, and capped off on Saturday, July 29, with a formal dinner. Rotary Club of Ala Moana celebrated this milestone with its four SIster clubs: Rotary Club of Abiko, Rotary Club of Feng Yuan, Rotary Club of Hiroshima Jounan, and Rotary Club of Osaka South West. The celebration began with a golf outing followed by a Welcome Party at Kapiolani Community College on Friday evening. Members were treated to a "Taste of Hawaii" evening featuring flavors of Hawaii including a live pineapple cutting demonstration. On Saturday, members reconnected at Oahu Country Club for a formal dinner featuring a live quartet while dining.